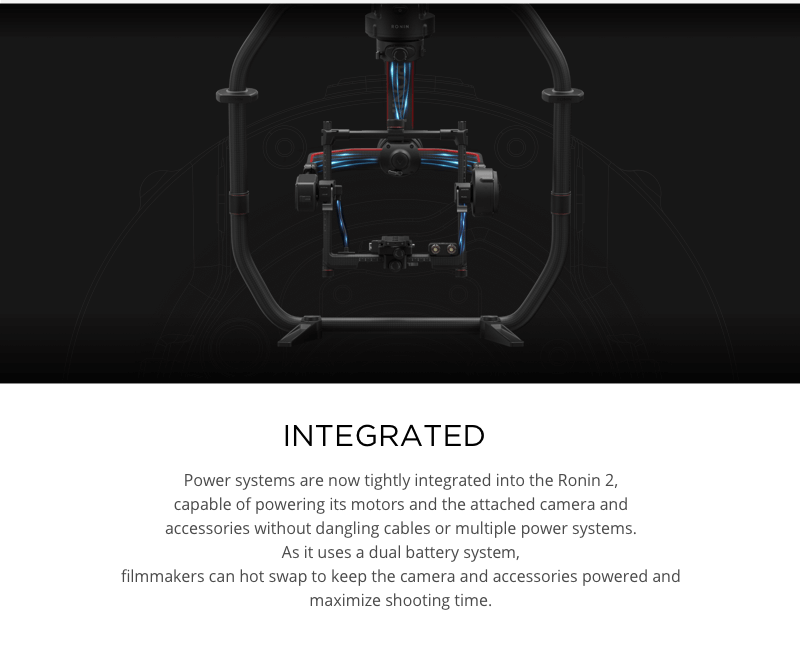 The Ronin-M 3-Axis Handheld Gimbal Stabilizer from DJI is a camera stabilization.. 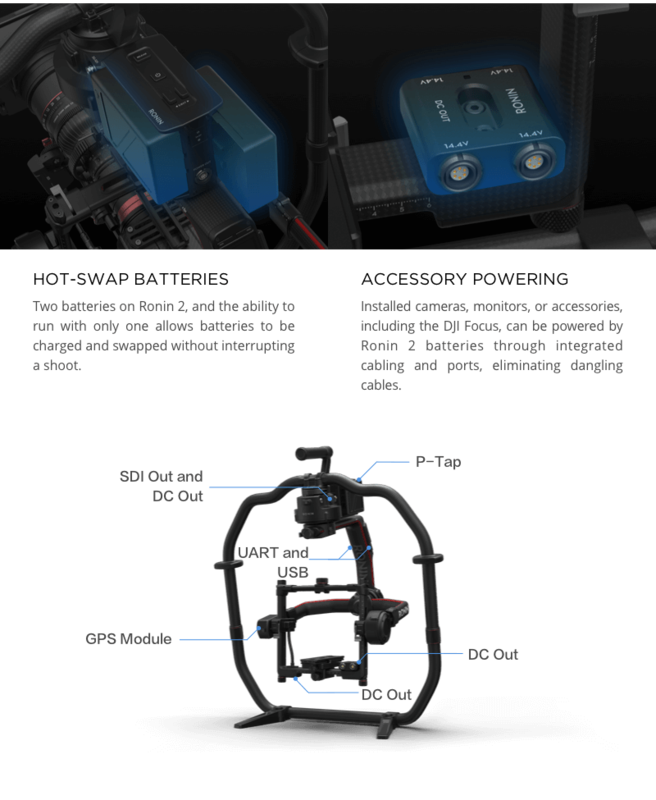 Compatible with DJI M600 Supports RED EPIC, ARRI ALEXA Mini and more cameras Designed for sta.. The Ronin 2 Accessory Mount utilizes a quick-release design allowing tool-free installation of itsel.. 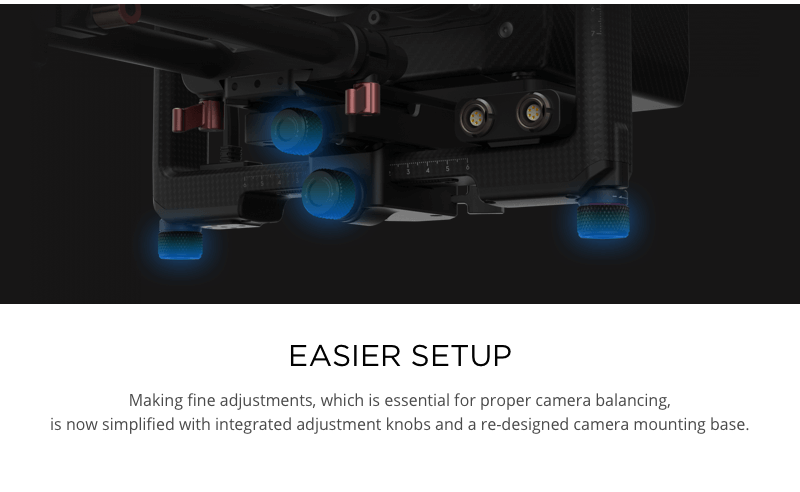 The Universal Mount offers an attachment point for the gimbal, allowing it to be mounted to various .. The Multi Tool for Ronin 2 gives you all of the different tools you need to work on your DJI Ronin 2..
DJI Ronin 2 Extended Camera Base Plate ..
Overview The Ronin 2 Power Hub provides 3 industry standard power/data connectors, powering acc..
Overview The detachable design offers increased flexibility with a greater tilt movement range by..
Overview The RED Power Cable powers a RED camera by connecting the DC IN port on the ..
Overview The ARRI Alexa Mini Power Cable powers an AR..
Overview The 2-pin Power Cable powers a video link by connecting the 2-pin DC IN port on the vi..
Overview The DC Power Cable powers a field monitor by connecting the DC IN port on the monitor ..
Overview The USB Type-C Data Cable transmits data and/or power between Ronin 2 components in th..
Overview The RED RCP Control Cable controls a RED camera by connecting the CTRL port on the cam..
Overview The ARRI Alexa Mini Start/Stop Cable controls an ARRI Alexa Mini while recording video..
Overview The SDI IN Cable receives communication from a camera by connecting the SDI IN port on..
Overview The SDI Out Cable sends communication from a camera by connecting the SDI OUT port on ..
Overview The Ronin 2 Power Cable allows remote mounting of the Dual TB50 Battery Mount. Connect..
Overview Ensure safety of your equipment during transport with ..
Overview The LANC Control Cable controls cameras with a LANC port, such as the BMCC, Sony FS5, ..
Overview Dedicated speed control knobs can be used to convenien..
Overview The Ronin 2 Thumb Controller is compatible with the Ro..
Overview The DJI Pro Dual Band Soft Antenna supports dual tra.. This combo includes a stabilizer, transportation case, remote controller, camera power cables, and a redundant battery system. 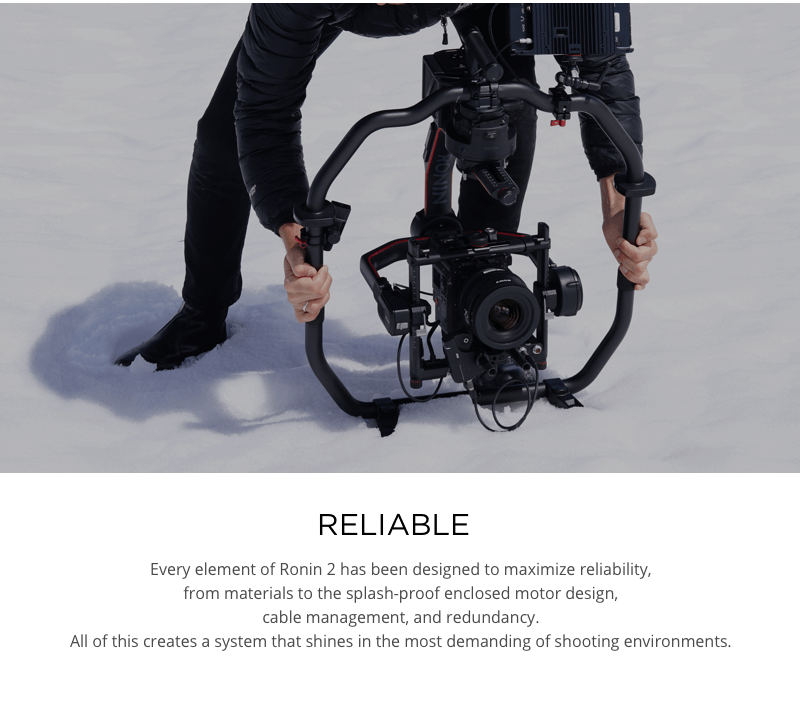 The Ronin 2 allows filmmakers to capture and transition between scenes effortlessly and is, without a doubt, the most versatile camera stabilization system available. It can be handheld or mounted on a vehicle, cable system, Steadicam, or drone. 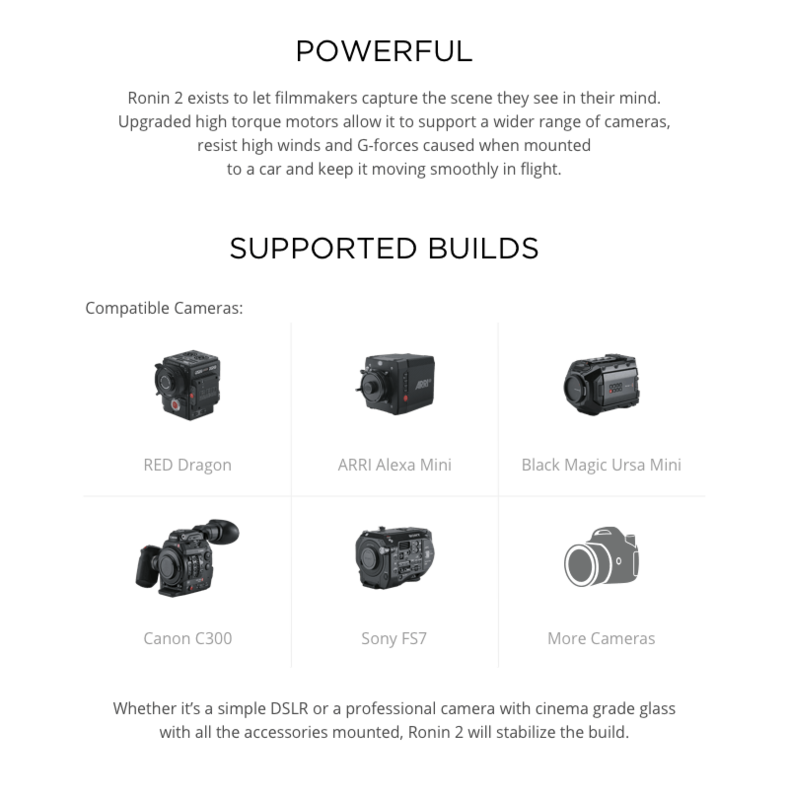 It supports up to 30 lbs (13 kg) of gear, giving creative professionals the flexibility and freedom to choose the perfect camera and lens for a scene. 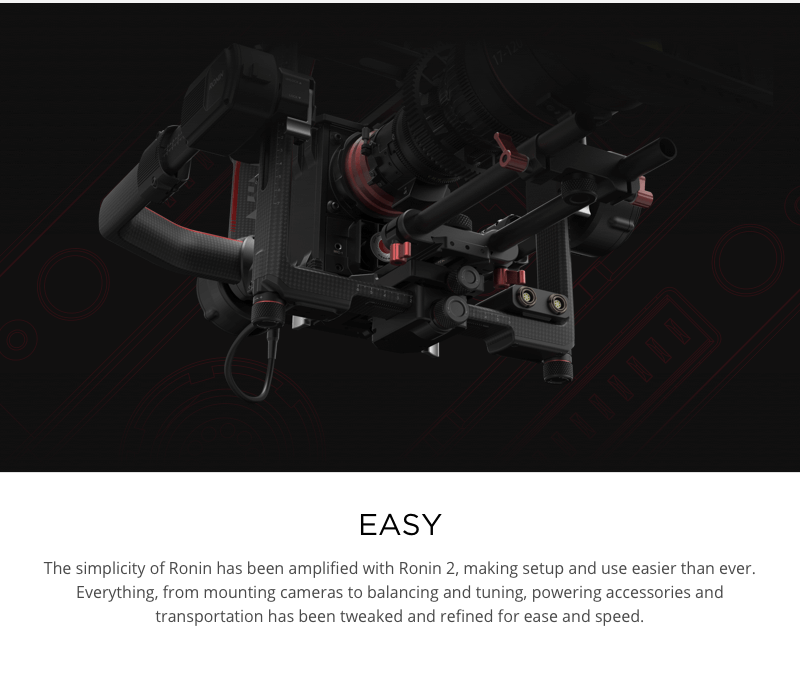 Based on the same transformative gimbal technology found in DJI’s original Ronin series, the Ronin 2 has increased power and torque to carry professional gear at speeds of up to 75 mph (120 kph). It has precise adjustment knobs, hot-swappable batteries for faster setups, and integrated power and internal cabling to manage the camera and accessories easily. Upgraded high torque motors allow the gimbal to support a wider range of cameras, resist high winds and G-forces caused when mounted to a car, and keep it moving smoothly in flight. 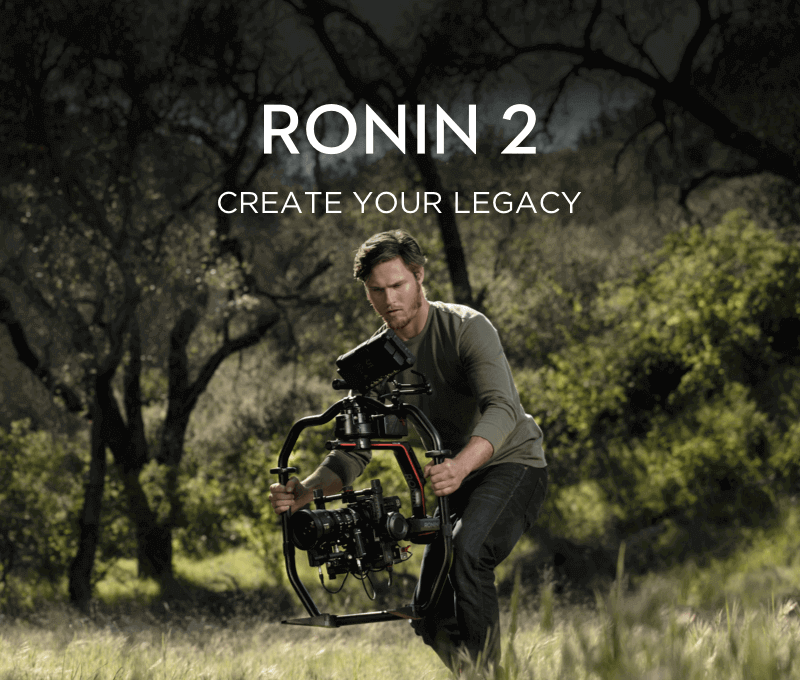 With up to eight times more powerful motors than previous iterations, Ronin 2 can withstand sustained speeds of over 75 mph with camera builds as heavy as 30 pounds. Thanks to encoded motors and enhanced precision, the Ronin maintains the same 0.02° of accuracy of its predecessors. A detachable grip allows Ronin 2 to stand up on its own and is easily separated when the lower part of the handgrip is not needed. 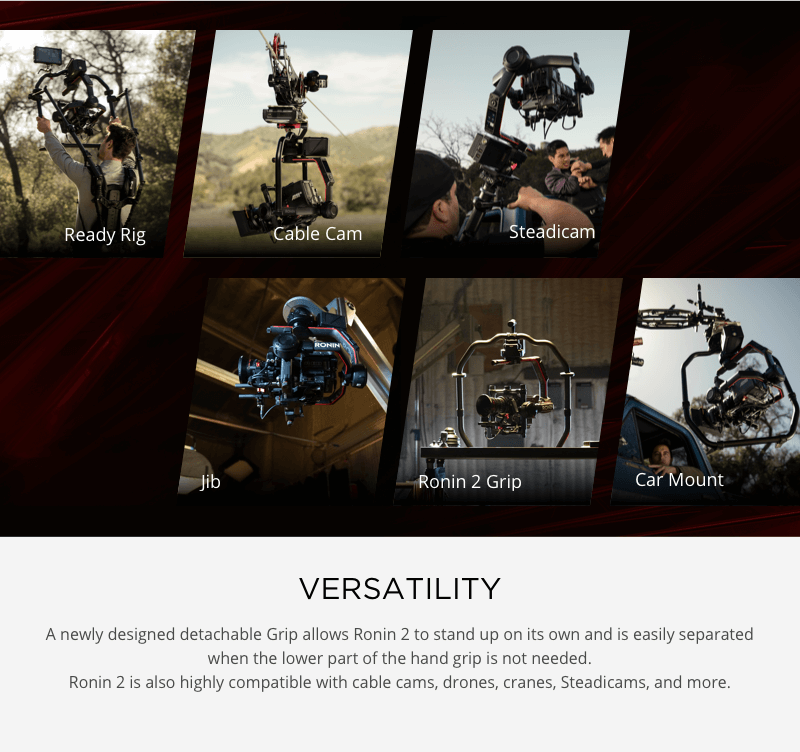 In addition to handheld work, the Ronin 2 supports mounting on cable cams, drones, Steadicams, vehicle mounts, and more. Making fine adjustments, which is essential for proper camera balancing, is now simplified with integrated adjustment knobs and a re-designed camera mounting base. 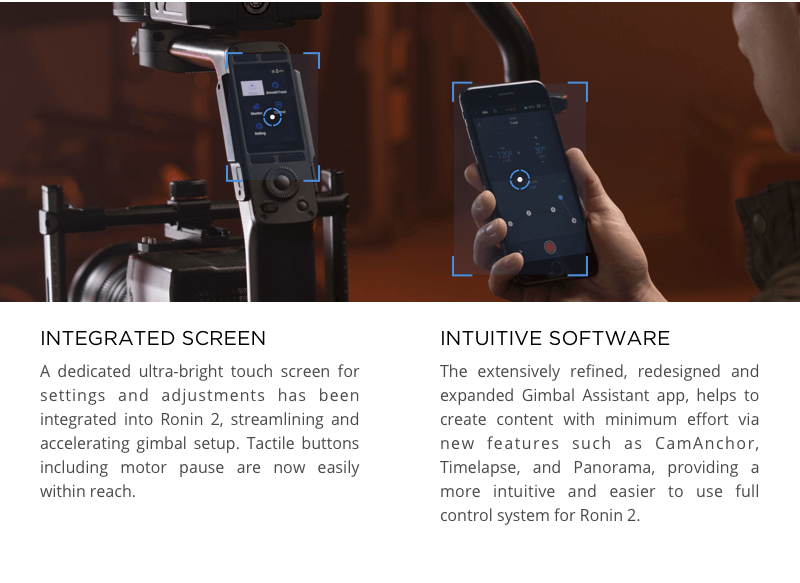 A dedicated high-brightness touchscreen for settings and adjustments has been integrated into Ronin 2, streamlining and accelerating gimbal setup. Tactile buttons including motor pause are placed easily within reach. 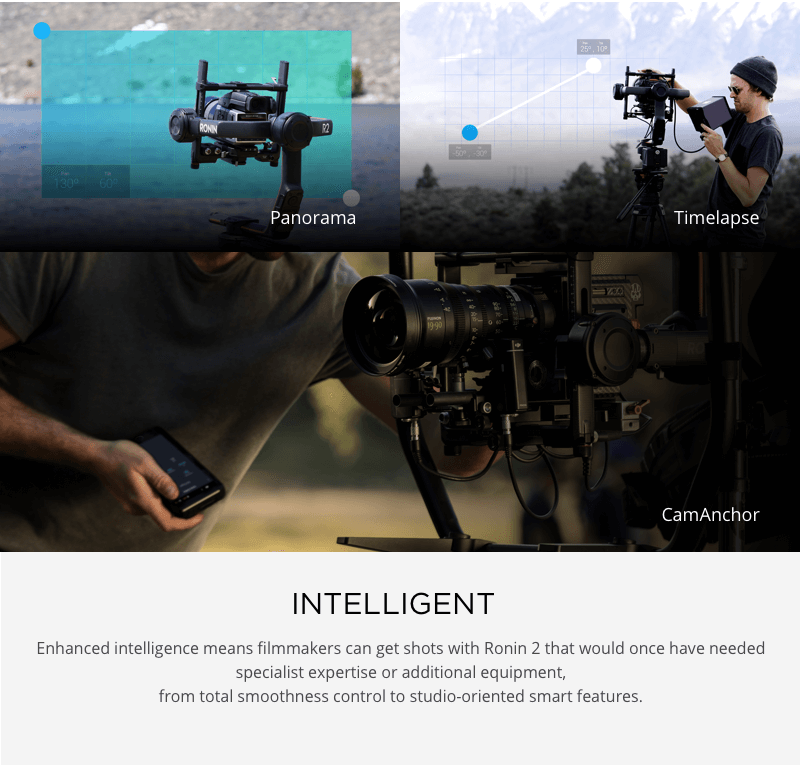 The extensively refined, redesigned, and expanded Gimbal Assistant app, helps to create content with minimum effort via new features such as CamAnchor, Timelapse, and Panorama, providing a more intuitive and easier to use full control system for Ronin 2. Enhanced intelligence means filmmakers can get shots with Ronin 2 that would once have needed specialist expertise or additional equipment, from total smoothness control to studio-oriented smart features. Intelligent features included Panorama, Timelapse, and CamAnchor modes. Two batteries on Ronin 2, and the ability to run with only one, allows batteries to be charged and swapped without interrupting a shoot. 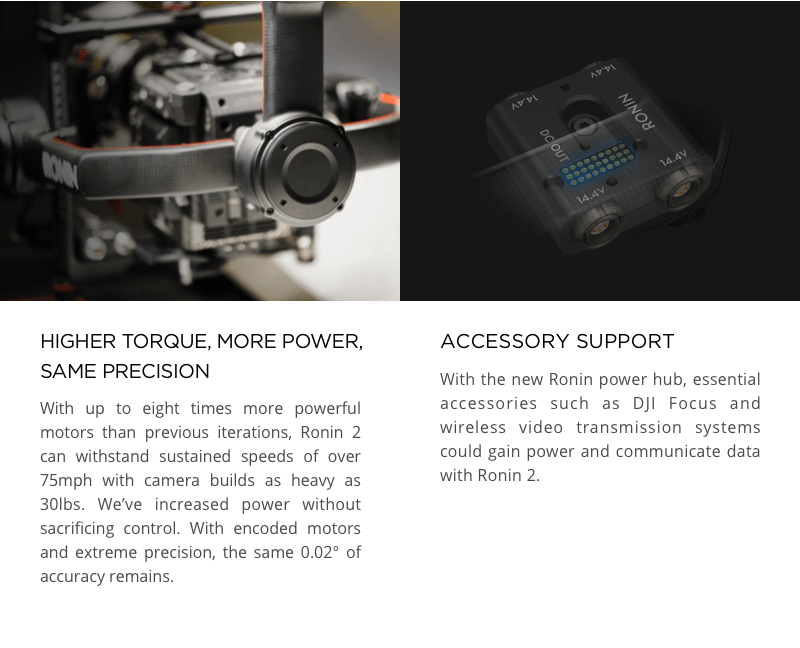 The Ronin power hub enables essential accessories, such as DJI Focus and wireless video transmission systems, to be powered by the Ronin 2 battery as well as communicate with the gimbal controller. 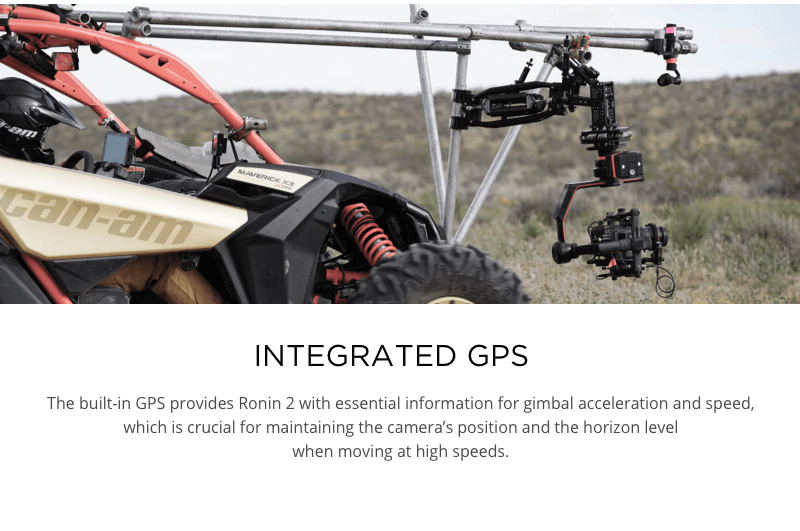 The built-in GPS provides Ronin 2 with essential information for gimbal acceleration and speed, which is crucial for maintaining the camera's position and the horizon level when moving at high speeds while mounted to a vehicle or drone. 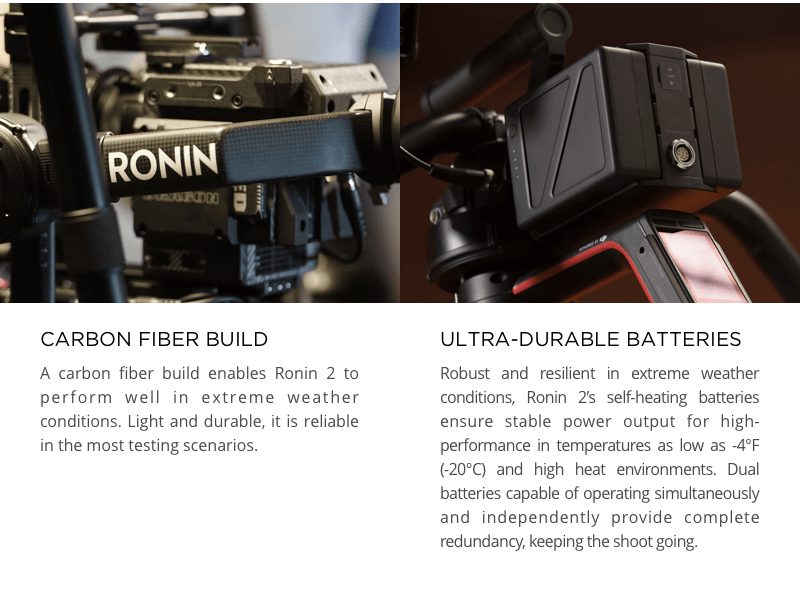 Robust and resilient in extreme weather conditions, Ronin 2's self-heating batteries ensure stable power output for high-performance in temperatures as low as -4°F and high heat environments. Dual batteries capable of operating simultaneously and independently provide complete redundancy, keeping the shoot going.